Mary Isobel Catherine Bernadette O’Brien was born in West Hampstead in north London, in 1939. Along with her oldest brother, Dion, she recorded her first tape of a song they sang while still children. Her dad was an unhappy accountant who dreamed of becoming a concert pianist, but never became one. While Mary’s mother, according to the Karen Bartlett autobiography, Dusty: An Intimate Portrait, “was continuously drunk and sat all day in cinemas.”As she grew up, Mary went to school at a Roman Catholic Convent. At the age of 18 she became a member of a female group named the Lana Sisters. The group sang backup to pop singer Al Saxton who had several Top 30 hits in the late 50’s in the UK, including a cover of Sam Cooke’s “Only Sixteen” and “You’re The Top Cha”. While Saxton enjoyed his moments of fame, Mary teamed up with her brother, Dion, and a friend of theirs named Tim Field. 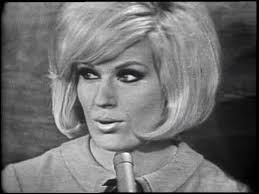 By the end of 1959 she had taken the stage name of Dusty Springfield. The trio, now known as The Springfields, got a record deal with Philips Records in 1961. In 1962 The Springfields had an international hit with “Silver Threads And Golden Needles”, which climbed ti #1 in Australia and went Top 20 in the USA. The song climbed to #3 in Toronto, #4 in Winnipeg, #14 in Montreal and #17 in Vancouver. Canadian Radio listeners liked the sound of that female voice they were hearing on the single and wanted to hear more. The Springfields were the first British group to have such success, predating The Beatles. In 1963 Dusty released her first solo single, “I Only Want to Be With You”. Her next single release was “Stay Awhile”. “Stay Awhile” peaked at #7 in Vancouver (BC), and #11 in New Haven (CT) and Windsor (ON). The song was co-written by Ivor Raymond and Mike Hawker. The songwriting duo had written Springfield’s debut single, “I Only Want To Be With You.” Raymond arranged and produced records for Billy Fury, Los Bravos, The Walker Brothers and later Ian Dury and The Blockheads and Julio Iglesias. Hawker previously wrote two of Helen Shapiro’s biggest hits, “Walking Back To Happiness” and “You Don’t Know”. Shapiro was a big seller in Vancouver with both “Walking Back To Happiness” and “Tell Me What He Said” climbing to #8. “Stay Awhile” concerns a couple who are dating. The singer is content to remain long into the night until they’ve expressed all the love they feel. However, their love interest is about to take flight. Though the night has just begun, they want to hurry off, run away. Some people like the chase and once they have someone hooked they lose interest. In an article in The Independent, Rachel Hosie explains that getting turned off when someone clearly expresses interest in us usually means we have problems with intimacy. While Miranda Athanasiou explains in an article in Elite Daily.com that there are a number of possibilities why someone runs hot and cold in the early stages of dating. The first is you could just be one of several options and are not a priority. Another is that they have had a change of heart, they might not like you that much after all. Or they are putting on the brakes, having not decided if “you’re the one.” Another reason is you’re not part of your date’s picture of the life they want. 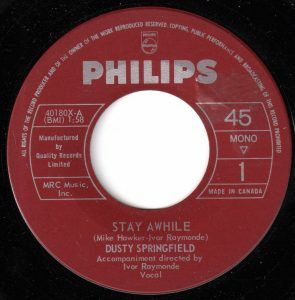 If the person in Dusty Springfield’s “Stay Awhile” finds this person dating them keeps pulling away and hurrying off, it may be time to give that person some space. You can’t make someone love you if they have reservations about you. The pattern of hesitancy about you may only persist, even if the presenting concern gets addressed. Dusty Springfield had a series of hit records including the Burt Bacharach tune, “Wishin’ and Hopin’” in 1964, her follow-up to “Stay Awhile”. In January, 1965, Dusty in San Remo, Italy, as an entrant in Italian Song Festival where she reached the semi-final. At the festival she heard Pino Donaggio perform a song titled “Io Che Non Vivo (Senza Te)”. Its English version, “You Don’t Have to Say You Love Me” was sung by American country singer, Jody Miller. Dusty fell in love with the song and recorded it. Her version became a #1 hit in the UK in the spring of 1966 and on the June 19, 1966, CKLG pop chart in Vancouver. Dusty was a booster of American R&B music and her covers of soul singers across the Atlantic introduced the record buyers in the British Isles to people like Aretha Franklin and Gladys Knight. On one of her singles she was backed by Doris Troy of “Just One Look” fame. A forerunner of the Northern Soul genre, Dusty Springfield’s covers of soul music was an ear-catching fusion and record-buyers rewarded her with her album, Dusty in Memphis, and others. The Look of Love. The title track, “The Look of Love,” was featured in the James Bond film, Casino Royale. A second single from the album was “What’s it Gonna Be”.